Astrometry is the art of carefully tracking the motion of a star in the sky. With enough precision, you should be able to spot the tiny deviations that a planet’s gravity will cause. I won’t go into details, but it’s all about celestial mechanics and extreme accuracy. The thing is, the concept was first attempted about 50 years ago, but it’s only now that astronomers have finally found a planet this way. And it took a group of NASA scientists 9 years to do it. In the UK, that’s about 3 generations worth of PhD students! 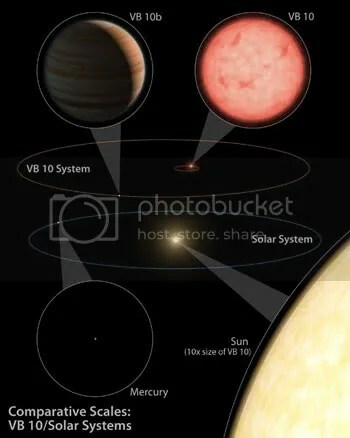 So, lying around 20 light years from us in the constellation of Aquilla (The Eagle), is a miniscule red dwarf star named VB10. Fantastically enough, it has a companion planet, systematicaly named VB10b. A hulking gas giant 6 times the size of Jupiter in an orbit comparable to Mercury’s in our own solar system. This image shows a comparison (click it to be taken to a larger image and a full caption). That seems close until you consider how tiny VB10 is. And it’s really tiny! Actually, for a long time, it was the smallest star we’d found in the galaxy. Under a twelfth the mass of the Sun, it’s close to the lower limit for how small a star would be. Much smaller and it would be little more than a brown dwarf. A star this tiny doesn’t give out much heat, so despite a Mercurial orbit, this gas giant is thought to be closer to our own Jupiter in temperature. The NASA press release conjectures though that being a gas giant, it might be somewhat Earth-like in temperature. That seems fair to me. After all, we know that our friendly neighbourhood gasballs all seem to have an internal energy source keeping them warm. They also conjecture that any more Earth-like rocky planets might lie even closer to the host star. A miniature solar system, if you will. That rather implies that there’s a slim (but non-zero) chance of finding a planet in a habitable zone, if not around this star then around another similar one. Of course, whether or not red dwarfs are habitable is still a matter of open debate. One thing’s for certain though. The more we learn about planets, the more we’re realising how ubiquitous they really are in the Galaxy! The NASA press release is available here, together with a little video explaining a bit more about the astrometry behind VB10b’s discovery. This entry was posted in Imported from Livejournal and tagged astrophysics, celestial mechanics, planets, stars. Bookmark the permalink. 2 Responses to A wobbly star!